Theatre is for everyone. Whether you've enjoyed one of our performances or are new to the theatre and have never seen one of our shows, just imagine how much fun it would be to take part. You might want to help make costumes, run about backstage, make props, build our set...or perhaps you would like the lead role, we are always looking for new recruits. We draw performers and helpers from all over Edinburgh, and with a cast of at least 60 singers and dancers of all ages, (8 to 87 at the last check) and a dedicated team of front and backstage helpers, our shows just keep getting better and better. 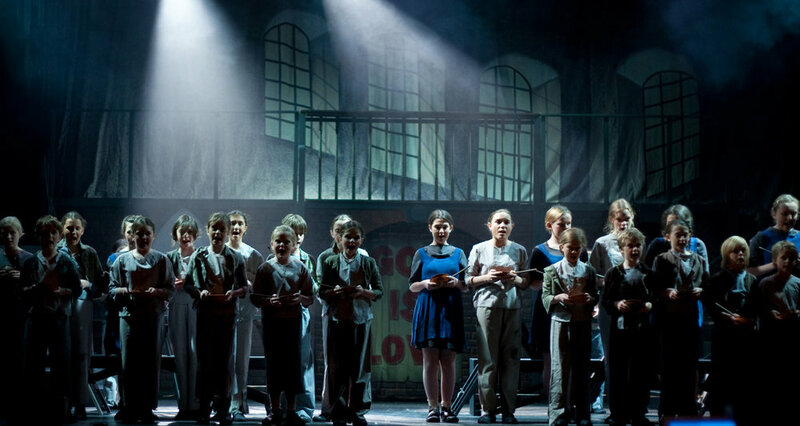 All of our cast are enthusiastic and talented amateurs, however we employ a huge range of professionals to support us, from our musical director and orchestra, right through to our lighting, sound and costumes, ensuring that both cast and audience have the most slick, professional and enjoyable experience possible. We perform our big musical shows in the Church Hill Theatre in the Morningside area of Edinburgh. This striking Category B listed pink sandstone church was converted into a theatre in the 1960s and for over 50 years has gained an established reputation as one of Scotland’s leading non-professional theatres. As well as being home to many of Edinburgh’s amateur theatrical companies, it is a popular venue for the Edinburgh Festival Fringe. We look forward to many more years performing in this wonderful venue. Formerly Balerno Community Songsters, we changed our name to Balerno Theatre Company in 1999 and have been going strong ever since. Our emphasis is on fun and professionalism - it is possible to have both, and our track record proves that. Not only do we stage classic musicals such as Annie, Hello Dolly! and The King and I, we also write our own pantomimes with our mixture of dames, evil villain, handsome good guy and the beautiful girl. We guarantee you shows full of laughter and fun and wonderful songs from current and classic West End and Broadway musicals. And occasionally, we’ll throw in the odd play for good measure.